Flamboyant and full of fun, Karamba certainly doesn’t shy away from making a bold first impression. Here’s hoping that there’s plenty more than just good looks from this colourful and intriguing betting site. 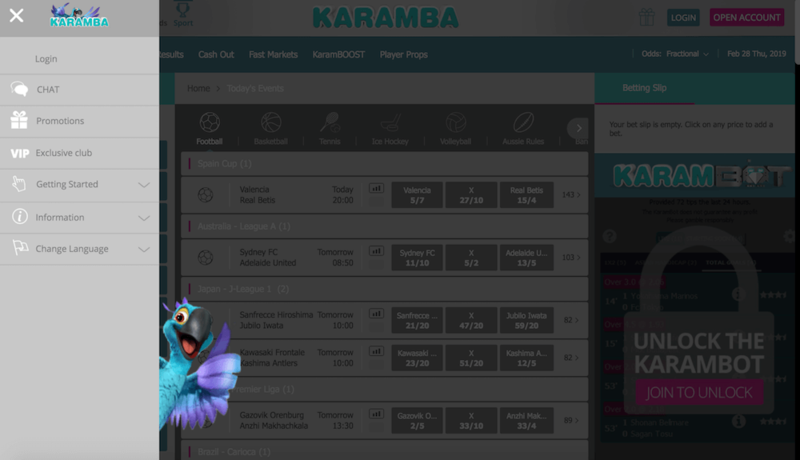 While it’s clear that Karamba’s main interest is in its casino – it’s what is most prominently presented when you first enter the site – sporting fans will be pleasantly surprised to learn that, on first impressions at least, the sportsbook doesn’t appear to be any kind of an afterthought. Plenty of effort has gone into its design, structure and presentation. It even has a £10 free bet to help entice new players. Karamba may look like a little lightweight for some users, but it appears that they’ve got plenty here beneath the hood. Let’s dig a little deeper and check out exactly what Karamba Sport has to offer. There are a few promotions on the sporting side of things, further reassuring us that Karamba are taking the sports side of things as seriously. We’ve already mentioned the free bet and we will go into detail about that in a moment, alongside a couple of others that are available at the time of writing. We say that because, more than any other part of a betting site, promotions can be subject to change and are often time restricted to a particular event that year, for instance. Therefore, there may be some differences when you visit the site. Also, while we will point out what we think are the most interesting and relevant terms and conditions but this is by no means intended to be a comprehensive look at that information. So, for the full details, make sure to check out the site for yourself. With that in mind, here are some of the sports promotions available on Karamba. £10 Free Bet: This one is quite simple. You deposit £10 at minimum odds of 2.00, and you get a £10 free bet. However, the winnings from the bet are not subject to wagering, so you can’t really complain as this is an ideal way of getting acquainted with the site. Give Your ACCA Wins a Karamboost: This is essentially a percentage reward which goes up to a total of 77% based on how high your accumulator bet selections are, with a minimum of a 4 fold bet with 1.2 minimum odds. You would have to bet 15 fold in order to receive the full bonus. It’s fairly standard, but an effective bonus. 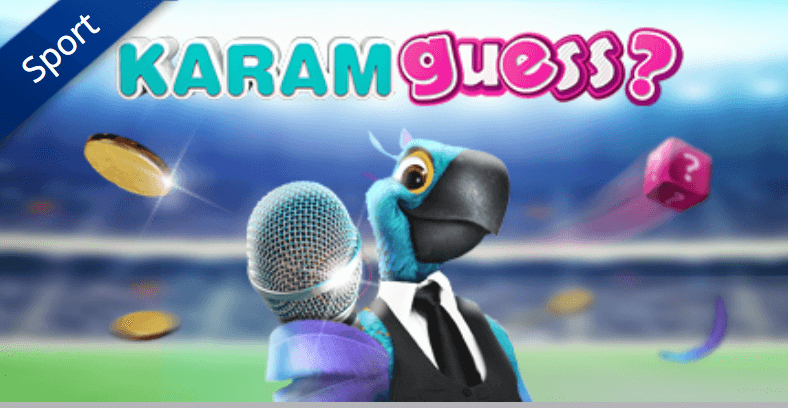 Karamguess: An interesting promotion here, and one which is actually pretty unique, which is rare for any betting site. Guess the correct answer to several questions and if you’re correct, you will win a risk-free bet of £20. Overall, we’re pretty happy with the selection of promotions presented at Karamba. It might not be the largest offering in the world, but it does include plenty of value. Each promotion here has the potential to improve a player’s site experience. 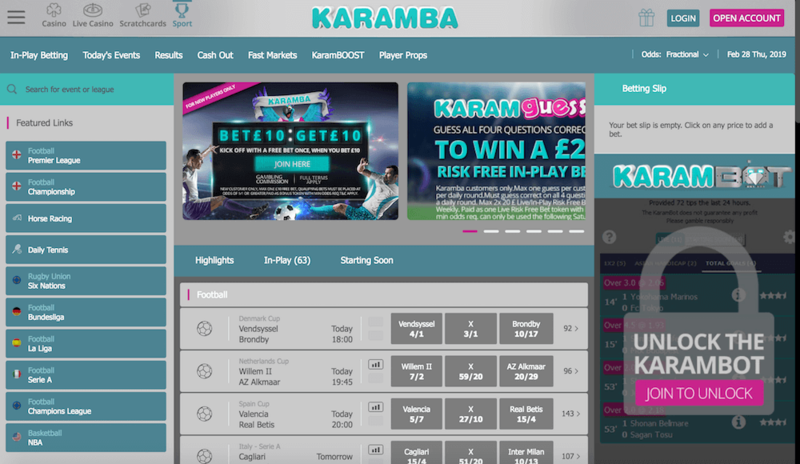 We’re happy to report that Karamba is no slouch when it comes to betting markets, with a huge amount of sports on offer. These include lesser known examples like trotting and Gaelic hurling, as well as specials and e-Sports, which even give you the option of which country you’re looking for with regards to the latter. We suppose this should be no surprise considering the massive amount of tournament options that are available. Take football, for instance. Not only will you find the Premier League and the Champions League, but also things like the Italy Serie C Cup. Generally, Karamba is excellent in terms of variety. 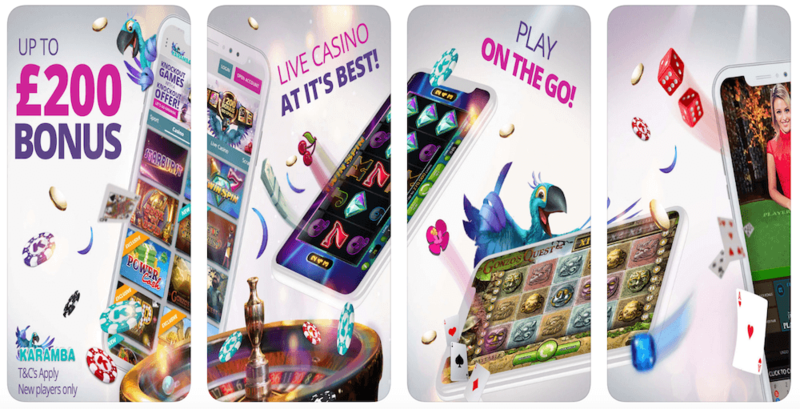 This is also true, as you might expect, of their casino options, with a massive selection of games from multiple providers ensuring a wide reach of content. Players who want to keep up with all the casino and sports betting action while on the go will be happy to hear that Karamba does have a mobile app. This is available to download for free from both Google Play and the Apple store. It features all the top casino, live casino and sports betting options from the desktop site, with customer support on hand to help with any issues. All in all, the Karamba app gets a thumbs up from us. Unfortunately, there is nothing in the way of live streaming nor virtual sports, or anything such as live commentary on the sports side of things. There is a very impressive live casino. However, that’s about all there is to say here. This is a shame considering how well the site does in so many other areas. Quite often, very good gaming sites let themselves down by not having all of the banking information easily accessible. And while we would like this to be a bit more obviously placed on site as opposed to being part of an information link on a drop list, here we have a lovingly organised table to tell us almost everything we need to know. Payment methods include VISA, Mastercard, Bank Transfer, sofort, Trustly, Skrill, Skrill 1-tap, Neteller, ecoPayz, Euteller, Zimpler, eps, Wire Transfer, Paysafecard, Entropay and Fast Bank Transfer. The type of method you use to deposit funds will be the same you use to withdraw funds. All deposits – with the exception of wire transfer, which can take up to 6 days – are instant, while withdrawals depend on a variety of factors. There are two things missing here and that’s information about fees and documentation. The latter we found elsewhere, with Karamba explaining that you may be required to provide things like a debit card used or proof of e-wallet, government-issued photo identification and proof of address. Some organisational improvements could be utilised here, but Karamba is better than most for addressing this issue clearly. With around the clock access to a live chat function, you can’t really get much more convenient than this when it comes to customer support. On top of that though, a toll-free number, as well as an email option, are available, where you will get a response to within 24 hours. They have a good reputation for customer service, which is also our assessment of our interactions with the Karamba help team. 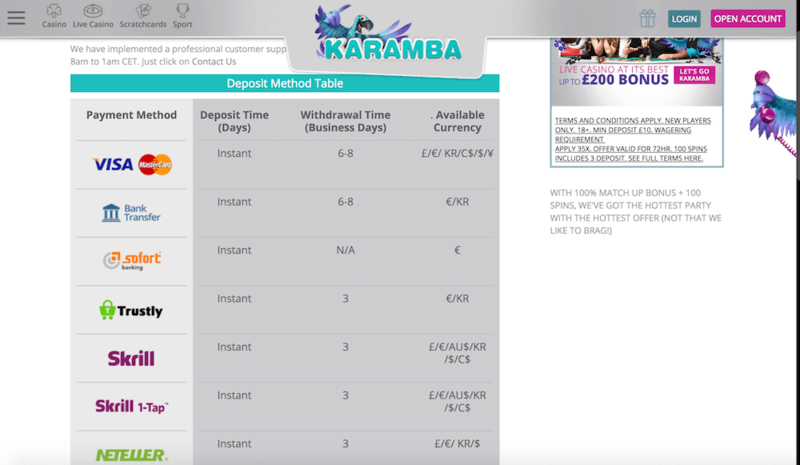 Karamba is owned by ASG technologies and are fully licensed under the Gaming Regulation of Malta, as well as being licensed in Great Britain by the United Kingdom Gambling Commission. Their odds are also competitive and they utilise SSL encryption in order to keep your data safe. On top of that, players using their casino facilities will also be reassured to know that they are audited by a third party company to ensure their games are genuinely random and fair. 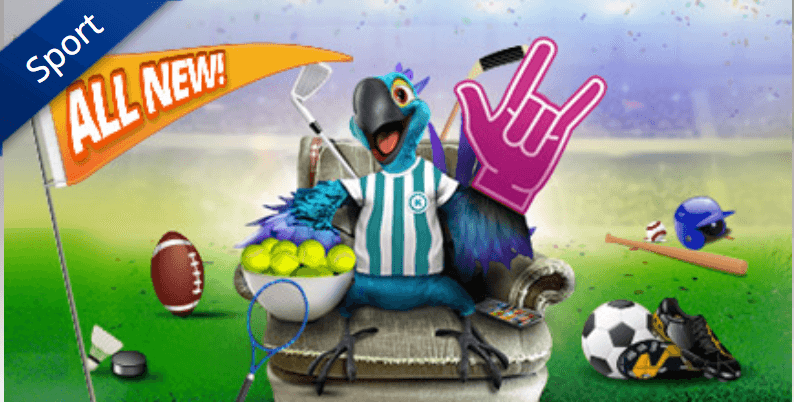 We’ve already mentioned their sports bonuses, but perhaps the biggest of them all on Karamba is their Casino Welcome Bonus. 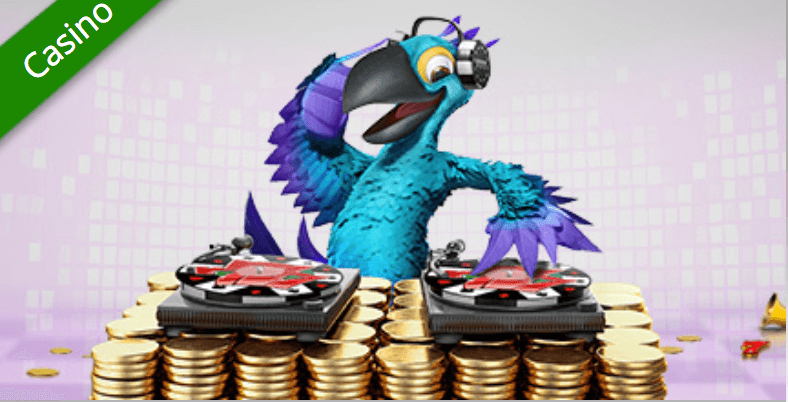 This is a 100% bonus up to £200 alongside 100 spins, with a minimum deposit of £10. The wagering requirement here is 35x, which is competitive but not the best we’ve seen. Those who were disappointed by the small scale of the sports bonus may actually view it now as the better of the two. Still, that’s around the standard requirement for a bonus of this size. Karamba manages to balance its sense of fun and flair with a lot of content. We were worried that – as is the case with many sites that have both casino and sportsbook options – one would clearly take precedence over the other. Happily though, that does not seem to be the case here, with each getting a good amount of content. Clearly, the effort has gone in to make this site enjoyable all across the board, and it is. The promotions are good, the variety available is generally excellent with only a couple of exceptions, and the site is easy to use and does a good job of explaining itself for the most part. There are areas which can use improvement though. For example, we’d love to see a virtual section in this colourful environment. But for the most part, Karamba is a rock solid site with plenty of personality.